On Wednesday, October 31, 2018, our mother and ‘babcha’ Dobrodika Josephine Stetzenko of Kelowna,BC passed away at the age of 89 years. Born in Ukraine, she grew up in France during the war and was reunited with family members in Winnipeg, MB. 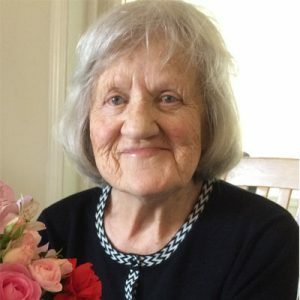 She served alongside her husband in many small Ukrainian Orthodox parishes across the prairies, while tending to the needs of a family of energetic and growing children. Nothing gave her more pleasure than to feed her children and then their children. She will be missed by her son Nick of Kelowna, BC, her son Bill of Edmonton, AB and his daughter Tamara; by her daughters Larissa of Edmonton, AB and Tanya (Dave) Pritchard of Kelowna, BC and their children Owen and Moira. Josephine was predeceased by her husband Right Reverend Mykola Stetzenko; and sons Taras and Myron. Panakhyda (prayers) will be said on Sunday, November 4, 2018 at 6:00 pm at Springfield Funeral Home, 2020 Springfield Rd, Kelowna, BC, funeral rite on Monday, November 5, 2018, 11:00 am at the Ukrainian Orthodox Church of Sts. Peter and Paul, 1935 Barlee Rd, Kelowna, BC with a reception to follow at Springfield Funeral Home. After the reception, the interment will take place at Lakeview Memorial Gardens, 2850 Dry Valley Rd, Kelowna, BC. The prayer service for STETZENKO, Josephine is scheduled for Sunday, November 4, 2018 at 6:00 pm at located at 2020 Springfield Rd, Kelowna, BC. The service for STETZENKO, Josephine is scheduled for Monday, November 5, 2018, 11:00 am. Below you will find the map for the service location and the contact information should you have any questions. A reception at Springfield Funeral Home will take place following the funeral. After the reception, the interment will take place at Lakeview Memorial Gardens, 2850 Dry Valley Rd, Kelowna, BC. My condolences to the Stetzenko family on your loss..
May the caring thoughts of others comfort you at your time of loss, and may time ease the sorrow you feel today. With Sympathy from the members of the Ukrainian Orthodox Church of All Saints Kamloops, B.C. So sorry for your loss Tanya, Dave, Owen, and Moira. Our thoughts are with you at this time. Our sincere condolences on the loss of your mother and grandmother. May her memory be eternal. Babcha/Josephine was a good friend to me over the years I knew her. She always invited me along for Sunday brunches when she visited Edmonton and that kindness will always be remembered. In your time of grief and going forward, I wish you all strength and peace. Dear Tanya, Dave, Owen, Moira, and family, Our sympathies and deepest condolences upon the passing of your +mom. Love from Andrea, Oleksa, and Gabriel. Memory Eternal! Vichnaya Pam’iat!